The Tutankhamun London exhibition includes information, housed in galleries, based on various themes including Egyptian Religious Revolution. Comprehensive facts and information on Egyptian Religious Revolution can be accessed by our sitemap. But this page details fast facts and info that we hope will 'wet your appetite' for Ancient Egyptian History and the Tutankhamun London Exhibition including Egyptian Religious Revolution. Fact 9 The role of the priest in the new religion was decreased as only the Pharaoh and his chief wife Nefertiti were allowed to directly worship the Aten. Fact 10 Akhenaten ordered that all images of all other gods were ordered to be destroyed. Fact 16 Temples to the old gods were reopened, their worship was allowed and the roles of some of the priests of Amun were restored. But the god Aten remained as the supreme god, allowing continued worship of the Aten. Fact 17 After a brief rule of just 4 years Ay died. Their names were struck from royal lists and their tombs and monuments were usurped. 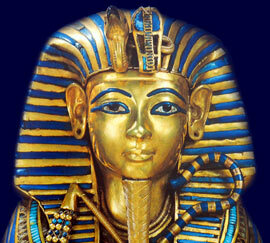 Fact 18 General Horemheb became Pharaoh. Horemheb had the names of Ay, Akhenaten, Nefertiti and to a lesser extent Tutankhamun publically condemned and removed from Ancient Egyptian records and history. Each section of the King Tut website addresses all topics and provides interesting facts and information about the Golden Age of Pharaohs and of Egypt London Exhibition. The Sitemap provides full details of all of the information and facts provided about the fascinating subject of the Pharaoh Tutankhamun and the Egyptian Religious Revolution.